Hana duffle bag with indian chain stitch details. A great over shoulder bag for the weekend or even an everyday gym bag for the summer. Featuring black and blue chain stitch embroidery in this fun floral design for summer. This over shoulder bag has been made from repurposed embroidered bed throws so that you can carry everything for the day in this over sized shoulder bag. The perfect bag to hang out with by the pool. Fully lined with inner slip pocket. White zipper with real leather puller. All throws used are sourced and then made into bags in Jaipur, India. Each bag is unique having been repurposed from bed throws. Variations in pattern making each one unique. Made in small limited edition batches. The family that cuts and stitches our bags are third generation master tailors who take great pride and care in their work. 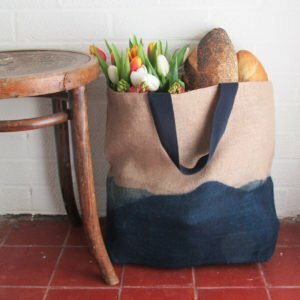 This bag can be washed on a cold wash or hand washed. Reshape while damp and lay flat to dry. Sourced Recycled Textiles and Handmade in Jaipur,India.